The ability to rationally design biological systems holds tremendous promise for many biotechnological and biomedical applications. Synthetic gene circuits that sense, record, and integrate multiple signals, perform computation, and actuate outputs are key enablers towards investigating and engineering living systems and building next-generation therapeutics. Efforts towards realizing these goals have been hampered mainly because many biological events, such as biomolecular signaling, cellular interactions, and lineage progression, are transient and thus difficult to study within their native context. As a result, and due to technological limitations, the ability to study these molecular events in vivo and monitor and control their dynamics over time and space has remained a long-standing challenge in biology. To address this challenge, I have developed multiple DNA writing and molecular recording technologies that enable continuous and autonomous recording of signaling dynamics and event histories directly into the DNA of living cells. In this talk, I will describe some of these technologies and discuss their applications for recording spatiotemporal molecular events, cellular computation, and building synthetic gene circuits with artificial learning capacity. I will conclude with my vision and perspective research directions on how further development of DNA writing and molecular recording technologies could lead to extremely powerful technologies for investigating and engineering biology, with applications ranging from building living biosensors and molecular probes for studying the human biology and diseases, to deciphering olfactory code and building an artificial nose, to mapping neural activities and connectome in a high-throughput and high-resolution fashion, to engineering smart, fast-adaptable cells and cell-based therapeutics that that could undergo synthetic Lamarckian evolution and evolve faster than possible by natural Darwinian evolution. 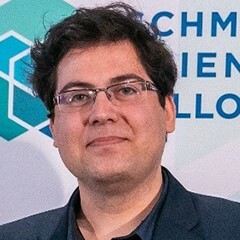 Fahim Farzadfard is a Schmidt Science Fellow, currently working with Ed Boyden (MIT) and George Church (Harvard Medical School) at the interface of Synthetic Biology, Bioengineering, and Neuroscience to develop next-generation DNA writing and molecular recording technologies for information processing and storage in living cells. Fahim obtained his PhD in 2018 from MIT, where he developed multiple foundational platforms for molecular recording and computation in living cells. He introduced the concepts of analog memory and DNA-based molecular recording and invented SCRIBE (Synthetic Cellular Recorders Integrating Biological Events), a modular and scalable platform for recording signaling dynamics into the cells own genomic DNA. He further developed a DNA writing and molecular recording platform (named DOMINO for DNA-based Ordered Memory and Iteration Network Operator) that uses a single-nucleotide-resolution read-write head to dynamically manipulate the genomic DNA and enables to perform highly robust and scalable memory and logic operations in living cells. He further pioneered one of the first implementations of CRISPR-based transcription factors for regulation of transcription in eukaryotes. Fahim’s successful academic record and research excellence have been recognized by multiple national and international awards including Harold M. Weintraub Graduate Student Award, Nat. L. Sternberg Graduate Thesis Prize, Helen Peake Carr Research Prize, the Regeneron Prize for Creative Innovation, and the Schmidt Science Fellowship.